“We invite everyone to attend this unforgettable evening and support a cause that is an historic landmark,” said Buttschardt. “For our Salt Lake and Davis County guests remember the Front Runner train is an excellent option and allows almost front door service to Historic Union Station.” Tickets are $50 per person and are available online at www.beehivecheese.com. 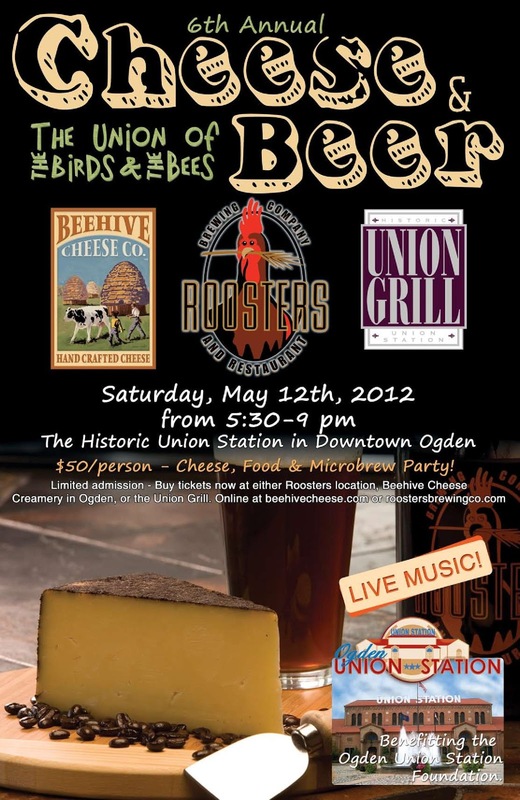 Tickets may also be purchased on site at Beehive Cheese Creamery, Roosters Ogden and Layton locations or at Union Grill. Guests will receive a commemorative glass to mark the occasion. The Union Station Foundation is the beneficiary of the 2012 Union of the Birds and Bees event. The Union Station Foundation celebrates our community’s history, memory and culture through the preservation of the historic train depot. Ogden Union Station is home to the Utah State Railroad Museum, Spencer S. Eccles Rail Center, the John M. Browning Firearms Museum and the Browning-Kimball Classic Car Museum. Through the museums, the Foundation seeks to educate the public about the significant role that Ogden played as the junction of the railroads and the expansion of America. For additional information visit www.beehivecheese.com or call 801.476.0900. About Roosters Brewing Co. For sixteen years Roosters has been a community gathering place for the eclectic population in Ogden. In 2005, owners Kym and Pete Buttschardt, and the Roosters crew opened a second location in Layton. Roosters serves a flavorful mix of pizzas, pastas and delicious entrees as well as daily specials. Favorites include their Famous Fish Tacos, Penne with Grilled Chicken and Creamy Pesto, Herb Crusted Rack of Lamb or Grilled Ahi Spring Salad. They offer more than 26 unique brews and beverages such as the popular Bee’s Knees Honey Wheat and Polygamy Pale Ale. Their brews are featured in hot spots along the Wasatch Front. About Union Grill Located in Ogden’s Historic Union Station among art galleries, museums and cool architecture, Union Grill was the founding restaurant of Kym and Pete Buttschardt and has served as a downtown community anchor for more than 20 years. The Union Grill’s friendly staff serves an interesting and wide variety of crave-able foods as well as the best desserts in Ogden. Union Grill operates a thriving full-service catering operation as well. About Beehive Cheese Beehive Cheese was established in 2005 by two brothers-in-law, Tim Welsh and Pat Ford. They are a Utah family that shares a passion for the artisan way of life and produce handcrafted cheeses to share with neighbors and cheese-lovers all over the world. Their products are made from local milk. Beehive Cheese is among only a few artisan cheese makers in Utah. Beehive Cheese received a silver medal at the World Cheese Awards for Full Moon and a bronze medal for the Apple Walnut Smoked. They have also received four first place awards for Barely Buzzed at the American Cheese Society Annual Competition. Since 2005, Beehive Cheese has received 17 major awards for their unique, hand-rubbed cheeses. About the Union Station FoundationThe mission of the Union Station Foundation is to celebrate our community's history, memory and culture through the preservation of the historic train depot. The Union Station Foundation's operating income is derived solely from donations, room rentals, gift shop sales and museum admissions. Public support is vital to keep this distinct Ogden landmark thriving.